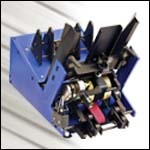 The Ink Jet Feeder is designed to integrate with almost all makes and models of Ink Jet bases and tabbers. 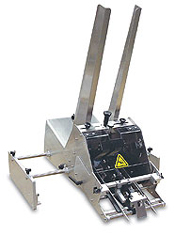 The Pick & Place Series are used for placing unusual shaped objects such as CDs, packets, pouches and credit cards directly into the inserter track. 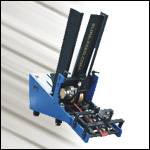 Our Packaging Feeders are designed for wrapping, boxing, traying and fulfillment applications. The EI Series feeder is designed to fit on the back of your inserter to replace the vacuum suction cup method. Feeder designed to feed product smaller than 2". 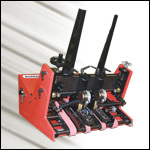 The EX is designed to clamp on the front table of most inserters, quickly adding a station to your existing machine. 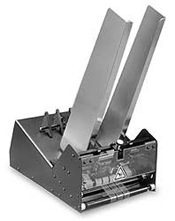 The Multi-Purpose Feeder can be added as a friction feeder to your Gripper Arm Inserter. Then with a flip of a switch you can use it on your Ink Jet Base or Tabber. A new level of feeding performance. High-speed counting, accumulating, and collating. 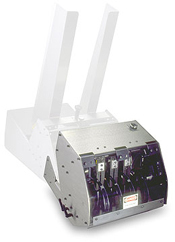 The new Servo Series feeders/dispensers have been designed to handle the most challenging products. From large single sheets and signatures to high-speed accumulating, the advanced servomotor technology provides all the power, accuracy, and performance you need. 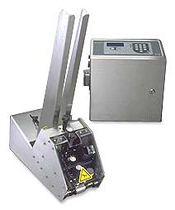 Servo Series feeders/dispensers can be used as “stand-alone” solutions or can be integrated with accumulators for high-speed collating systems. With industry leading performance you can feed as many as 50,000 A4 sheets/hour or batch count twenty-five 8.5” x 11” sheets at 25 batches/minute. Packaging operations pursuing greater productivity through automation require dependable feeding equipment that's simple yet flexible to meet changing needs. The ST-550 Universal Friction Feeder® features our patented Differential Friction Technology™ that ensures package integrity through precision product separation and singulation. Just as simple as it is accurate, the ST-550 boasts a 24-inch (60.96 cm) capacity hopper which reduces reloading time. As for setup, minimal adjustments are necessary and they're all done without tools. And with its modular design, the ST-550 is easy to maintain. In addition to its innovative mechanical design, the ST-550 is IQuipped™ with a revolutionary intelligent system controller. This powerful automation control center features an embedded microprocessor that provides an information management system and host communications via its standard RS-232 interface. Designed for continuous use in industrial environments, the ST-550 is built with a durable stainless steel enclosure and precision manufactured components. Many hardware and software options are available for your specific integration and application requirements. Just as simple as it is accurate, the ST-850 boasts a 24-inch (60.96 cm) capacity hopper which reduces reloading time. As for setup, minimal adjustments are necessary and they're all done without tools. And with its modular design, the ST-850, when necessary, is even quick and easy to maintain. In addition to its innovative mechanical design, the ST-850 is IQuipped™ with a revolutionary intelligent system controller. This powerful automation control center features an embedded microprocessor that provides an information management system and host communications via its standard RS-232 interface. Designed for continuous use in industrial environments, the ST-850 is built with a durable stainless steel enclosure and precision manufactured components. Many hardware and software options are available for your specific integration and application requirements. At the core of the ST-1250 is our patented Differential Friction Technology™ which ensures package integrity through precision product separation and singulation. Just as simple as it is accurate, the ST-1250 boasts a 24-inch (60.96 cm) capacity hopper which reduces reloading time. As for setup, minimal adjustments are necessary and they're all done without tools. And with its modular design, the ST-1250, when necessary, is even quick and easy to maintain. In addition to its innovative mechanical design, the ST-1250 is IQuipped™ with a revolutionary intelligent system controller. This powerful automation control center features an embedded microprocessor that provides an information management system and host communications via its standard RS-232 interface. Designed for continuous use in industrial environments, the ST-1250 is built with a durable stainless steel enclosure and precision manufactured components. Many hardware and software options are available for your specific integration and application requirements. At the core of the ST-1450 is our patented Differential Friction Technology™ which ensures package integrity through precision product separation and singulation. Just as simple as it is accurate, the ST-1450 boasts a 24-inch (60.96 cm) capacity hopper which reduces reloading time. As for setup, minimal adjustments are necessary and they're all done without tools. And with its modular design, the ST-1450, when necessary, is even quick and easy to maintain. In addition to its innovative mechanical design, the ST-1450 is IQuipped™ with a revolutionary intelligent system controller. This powerful automation control center features an embedded microprocessor that provides an information management system and host communications via its standard RS-232 interface. Designed for continuous use in industrial environments, the ST-1450 is built with a durable stainless steel enclosure and precision manufactured components. Many hardware and software options are available for your specific integration and application requirements. Experience versatile feeding performance made possible by our patented Differential Friction Technology™. This innovative feeding concept allows the V-710BC to reliably separate, singulate, and deliver a wide range of product types and sizes. This model also offers an impressive array of features that makes it remarkably easy to use. Setups and changeovers are quickly accomplished without tools. Even maintenance, when required, is simple and fast. 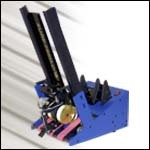 One friction feeder that works on your addressing base and gripper arm inserter? With the V-710DM this kind of flexibility is now available. The impressive flexibility of the V-710DM was not achieved at the expense of performance. Greater throughput is assured with reliable feeding to 10,000 pieces per hour on your inserter and up to 25,000 #10 envelopes per hour on your addressing base. 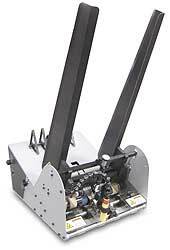 The V-710DM is designed to provide the flexibility of automating jumbo format gripper arm inserters and ink jet / tabber bases using one friction feeder. 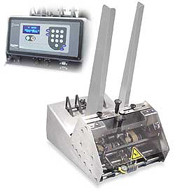 By simply repositioning the sheet-detect photo-eye mounted on a flexible arm extension, the V-710DM allows for quick and easy installation onto most major brands of vacuum / non-vacuum bases and gripper arm inserters. Simple single knob adjustments maximize operator productivity by minimizing setup and changeover time. 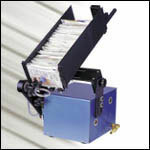 A large 24-inch (60.96 cm) capacity hopper reduces reloading frequency for even greater efficiency. 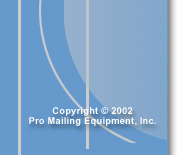 Production mailing operations demand maximum throughput from their ink jet printing, labeling, and tabbing bases. Whatever the brand on your shop floor—Kirk Rudy, Cheshire, Mail-Quip, Buskro, MCS, or Profold--with a V-710IJ your jobs will run at higher levels of productivity. Experience ultra-flexible performance that begins with our patented Differential Friction Technology™. This innovative approach to feeding precisely separates, singulates, and feeds virtually any type and size of material onto a transport base.The lightweight V-710IJ is equipped with an integral lifting handle and non-slip adjustable feet for easy moving and quick installation. Simple single knob adjustments maximize operator productivity by minimizing setup and changeover time. A large 24-inch (60.96 cm) capacity hopper reduces reloading frequency for even greater efficiency. Variable speed control allows operators to synchronize feed performance. An optional external run input provides the added convenience of integrated start/stop control. Maximizing inserter net throughput in production mailing environments is vital. The V-500 Universal Friction Feeder® continues our long-standing commitment to improving inserter productivity and job profitability. Powered by a DC-drive motor and clutch brake, the V-500 delivers speeds of up to 14,000 pieces per hour. Coupled with our patented Differential Friction Technology™, the V-500 provides inserters with powerful material feeding reliability and versatility. The V-500 is smartly designed to minimize downtime. Setups and changeovers are easily and quickly accomplished with the turn of a knob. 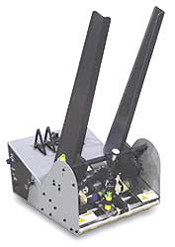 A large, 24-inch capacity hopper reduces operator reloading. 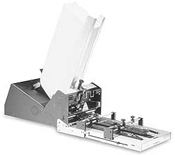 Even preventive maintenance is simplified with its unique easy access hinged enclosure. 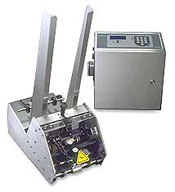 For added utility, the V-500 is also a low-speed solution for ink jet printing, labeling, and tabbing jobs. 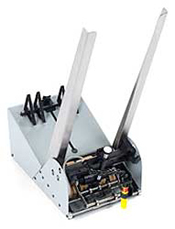 Variable speed control enables operators to synchronize feed performance. The rugged V-500 is built to last with steel construction and quality precision parts. 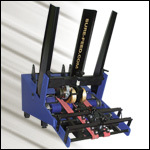 Whatever the inserter on your production floor--- Phillipsburg, Inscerco, Kern, or another similar type---with a compact Reliant 1500 aboard you'll operate at a new level of productivity and profitability. Experience ultra-flexible performance that begins with patented Differential Friction Technology™. 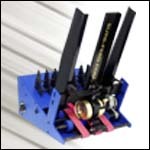 This superior feeding method precisely separates, singulates, and presents virtually any type and size of material to your inserter's gripper jaw. Efficiently designed for maximum operator productivity, job setups and changeovers are easily and quickly accomplished with the turn of a knob. A large, 24-inch (60.96 cm) capacity hopper is conveniently loaded from the front or back. The brushless and clutch-free motor provides dependable feeding performance up to 10,000 pieces per hour. The rugged Reliant 1500 is built to last with quality precision components. 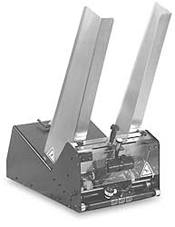 One friction feeder that works on your ink jet printing/labeling base and your gripper arm inserter? With the Reliant 2700, this kind of flexible performance is no longer future technology. Experience a new standard for versatility in mail processing environments. 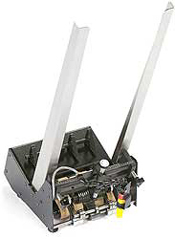 Just a flip of a switch is all it takes to change from "continuous" operation for high speed ink jet printing/labeling to "presentation" operation for gripper arm envelope inserting. The impressive flexibility of the Reliant 2700 was not achieved at the expense of performance. Greater throughput is assured with reliable feeding to 10,000 pieces per hour on your inserter and to 144,000 pieces per hour on your vacuum transport base. Greater stack heights and simple setups further add to job productivity. Tall stack heights of 8.5 x 11 and A4-sized sheets are fed with complete ease. Setups and changeovers are easily and quickly accomplished without the use of tools. Even maintenance, when necessary, is simple and fast due to its modular design. 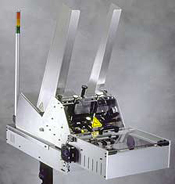 Designed for dependable one shot and batch count feeding, the Reliant 3700 are ideal for wrapping and envelope inserting applications. Experience versatile feeding performance made possible by our patented Differential Friction Technology™. This innovative feeding concept allows the Reliant 3700 to reliably separate, singulate, and deliver a wide range of product types and sizes. These models also offer an impressive array of features that make them remarkably simple to use. Tall stack heights of 8.5 x 11 and A4-sized sheets are fed with complete ease. Setups and changeovers are easily accomplished without tools. Even maintenance, when required, is simple and fast. The CE-approved Reliant 3700 is available in either one shot or batch count modes. Its durable steel enclosures and precision manufactured components easily withstand the rigors of continuous use. Until now, printing envelopes on small offset presses has been difficult, slow, and not very profitable. 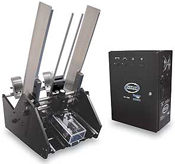 Now there's the Reliant 270RT, a superior accessory feeder that allows printers to setup quicker, run easier, and print more envelopes faster. Embodied in the Reliant 270RT is a patented feeding concept called Differential Friction Technology™. This innovation gives your press the flexibility to handle virtually all types of stocks up to 10 inches x 13 inches. A bottom feed, top-load design means no stopping for reloading. With its large 1,000-envelope (#10, DL, and A5) hopper, printers get more time to attend to the press and assemble printed stock. 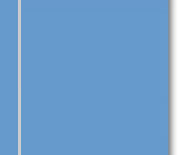 An integral alignment table ensures precise registration for enhanced print quality, even when you make a second pass. The Reliant 270RT is remarkably easy to install on most brands of small presses. Simply roll it up, adjust for height, and clamp it to the press. For added convenience, no wiring is required. The intelligent Reliant 270RT automatically synchronizes with the speed of the press. Only a few setup adjustments to the feeder are needed, and all are done quickly without tools. When you see a Reliant 270RT you'll know it's built to last. A stepper motor drive, stainless steel rollers, sealed precision bearings, and a heavy-duty steel enclosure are just a few of the many components that make it low maintenance. 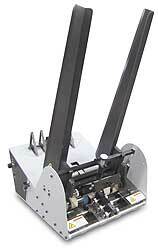 The Reliant 270RT...a superior feeder designed for superior printing productivity. Simplicity and easy setup. That was the goal was when we set out to design the Converge 900 Tip-On solution. Utilizing servo motor technology, products can be precisely placed at speeds up to 18,000 pieces per hour, with accuracy to +/- 1/16" (1.5mm). The Converge 900 is offered as a complete turnkey system or can be added to your existing vacuum transport. Innovative servo motor technology enables you to singulate and dispense the widest range of material types and sizes. Its modular design allows the Converge 900 to be integrated with a variety of systems. And, most importantly, the Converge 900 is easy to learn and simple to operate, helping you increase productivity and reduce cost.